I have been designing for the four C’s (critical thinking, communication, collaboration and creativity) throughout my career. Developing these four skills has become a focus of next generation education in order to prepare students for the rapidly changing workforce. It’s true that advancements in technology and new social trends are changing how we work, but they’re also having effects on our mental and social health as a society. As an educational designer, my goal is to prepare students for the future, both in terms of career prep and overall wellbeing. While the four C’s support developing a comprehensive skillset for the future workforce, I have incorporated two more into my own design philosophy to support the overall wellbeing of students: community and compassion. At a time when mental health issues, bullying and school shootings are regularly on news, it is clear there is a need for a sense of community within our schools. In a past visioning session with Beaver Local Schools in Ohio, the word “community” rose to the surface to describe an ideal school environment. To deliver this for the district, I introduced Learning Communities—student centered areas with open visual connection between spaces, displays for student work and lots of natural light—as an educational concept in my designs for their new K-12 school. 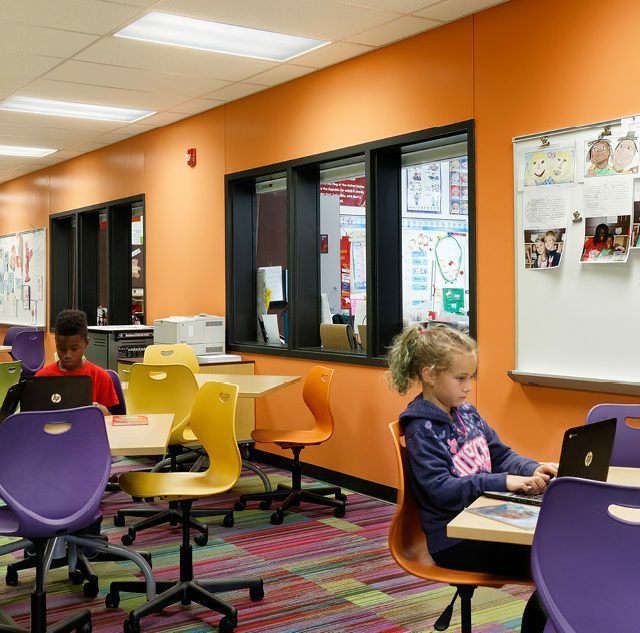 Learning Communities at Beaver K-12 School are open, student-centered spaces for collaboration. Designing for community and for collaboration are different concepts. While collaboration serves to teach students to work with their peers toward a common goal, designing for community involves creating an overall togetherness of body and mind through architectural layout, interior design and furniture. Student work galleries, quote walls and wall graphics serve to generate this feeling of togetherness within a transparent and visually connected layout. Natural light also goes a long way in positively affecting mood and creating a sense of wellbeing within the space. Emotional intelligence (which I’ve dubbed “compassion”) is the ability for students to recognize their own emotions and those of others, and to use that information to guide their thinking and behavior. Studies have shown that people with high emotional intelligence have greater mental health, job performance and leadership skills, making it a vital ability for today’s student. And emotional intelligence is only expected to become more important in the future. World Economic Forum projects it will be one of the top 6 skills sought after in the workforce by 2020. So how do we design to foster compassion and emotional intelligence? The best way to develop empathy in students through design is by offering them choices. In today’s curriculum, teachers serve more as a “guide on the side” rather than a “sage on a stage”, and the school design must support that. 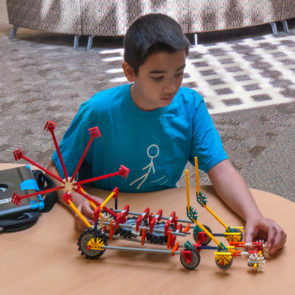 By offering students different environments (small group, large group or individual study) to complete their work, and various technologies to solve problems, we create choices that foster emotional intelligence. For me, community and compassion are necessary additions to the 4 C’s in school design. It is not enough to focus on developing skills for the future if ideals of mental health and wellbeing are left by the wayside. 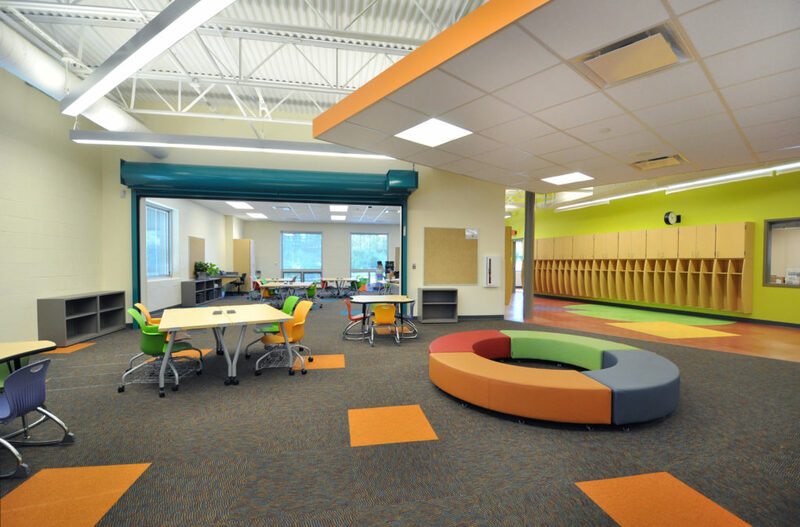 As school designers, it is our job to keep up with the changing needs of today’s students, as well as the students of the future, in order to deliver environments that nurture them in every way.